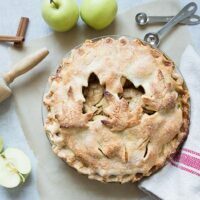 Traditional apple pie with tart green apples and an all-butter crust is the perfect dessert for any occasion! I usually only make apple pie during the holiday season. It’s one of those desserts that is really so simple to make, but is a huge crowd-pleaser. 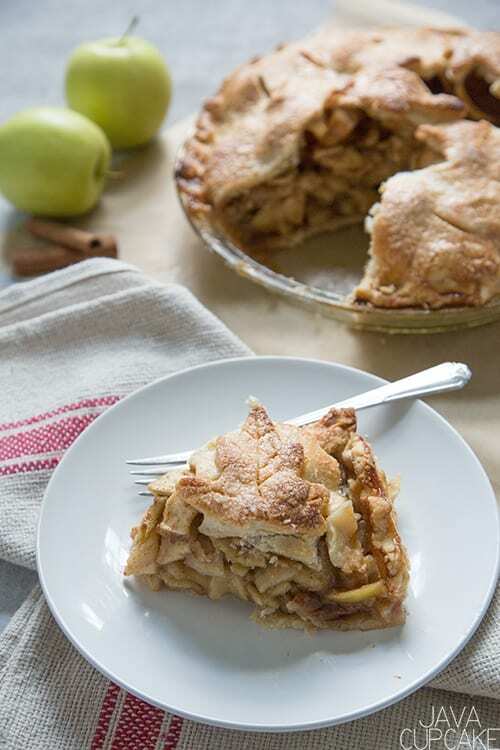 One of the tools I use to make this apple pie so easy to make is an apple-peeler-corer-slicer! The one I have is from Pampered Chef, however I’ve seen them in Walmart, on Amazon online and in Bed, Bath, and Beyond. If you make apple pie, you must get one of these! 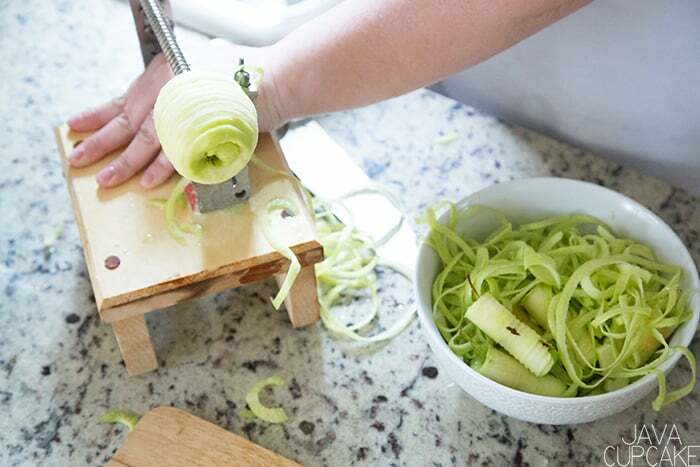 In about 20 seconds, one apple is completed peeled, cored, and sliced… perfect for pie! 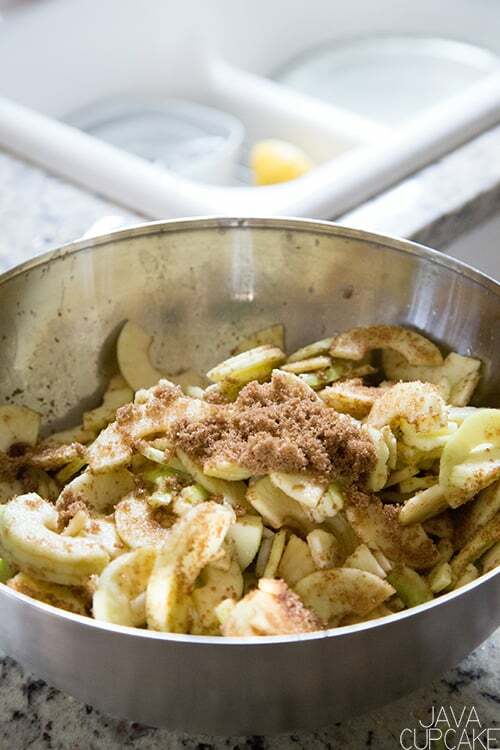 Once you’ve got your apples ready, you can start adding all the ingredients that make the pie perfection. Brown sugar, cinnamon, nutmeg, vanilla, a pinch of salt and BUTTER. SO MUCH BUTTER! For the crust you can either go simple with just a few slits in the top for ventilation or you can be creative! Lately, I’ve been following @karinpfeiffboschek on Instagram and her pie crust game is ON FIRE! You need to check her out! Personally, I like a simple crust only because I know my family doesn’t really care what the crust looks like… they’re interested in what’s under that crust! Using cookie cutters to cut a few shapes in the crust adds a simple, fun, seasonal, festive flair to the pie and takes no time at all to do. Finishing off the crust with an egg wash and sugar will help brown the crust and give it a sweet crunch! 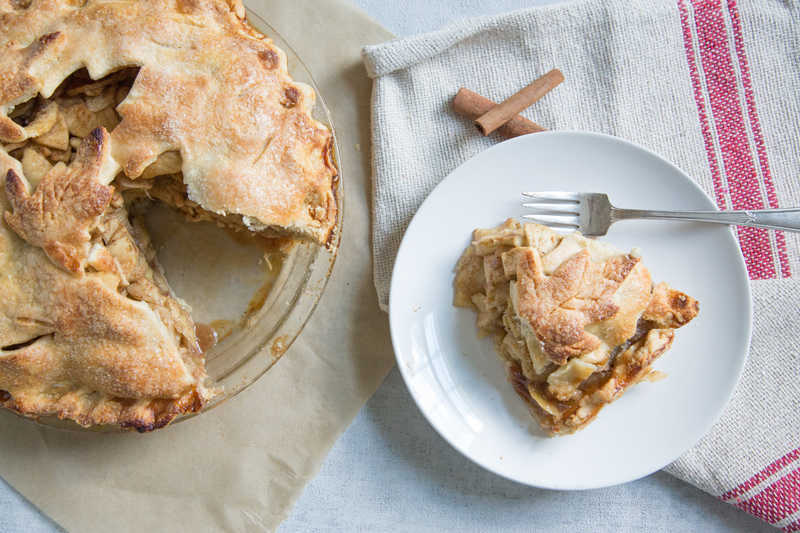 Bake this apple pie until it’s a caramel golden brown, let it cool, then slice it up and EAT IT! 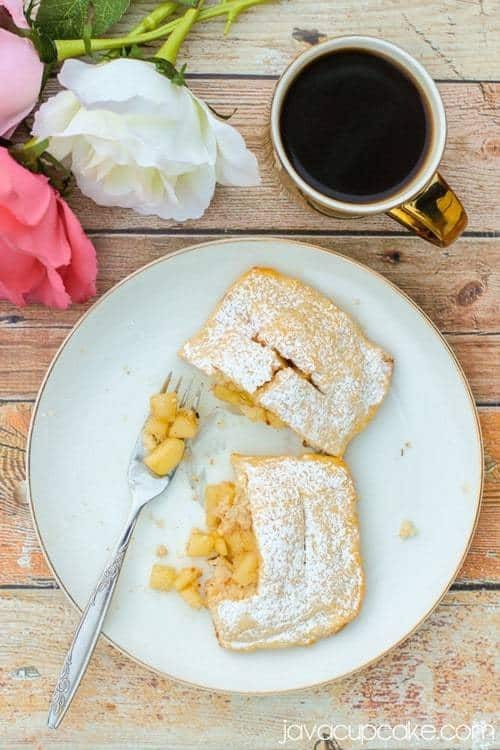 The combination of spices, sweetness of the sugar, tartness of the apples and the buttery, flakey crust make this apple pie PURE PERFECTION! Prepare first pie crust according to directions above. 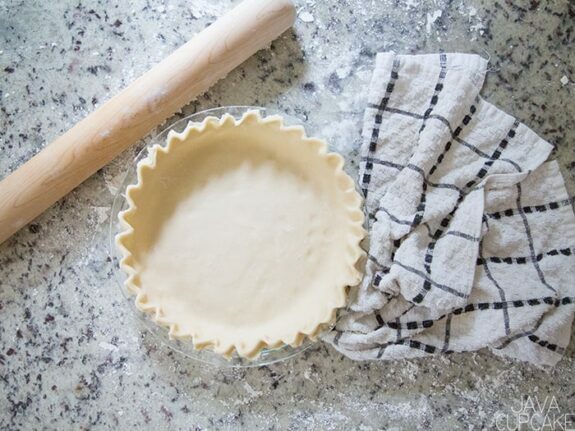 Gently place pie crust in pie plate and press into the plate. Trim excess dough off the edges. Chill until ready to fill. Peel, core, and slice the apples and place them in a large bowl. Add lemon zest, lemon juice, sugars, vanilla, salt, and flour. Toss together until completely coated. Pour apples into prepared cold pie crust. 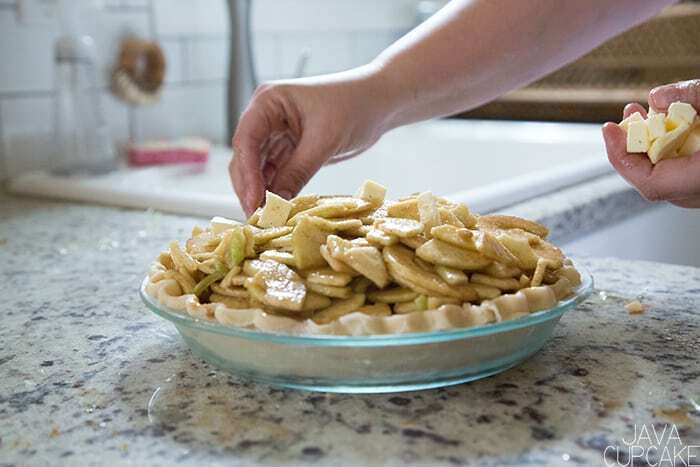 Gently press the apples into the plate so no pockets of space are left and apples fill the entire crust. Place small cubes of butter across the top of the pie. Use as much or as little of the butter as you want - there's no right amount of butter to add here. Chill while preparing top crust. Prepare second crust according to directions in recipe above. Roll out the dough and use cookie cutters to cut out a couple shapes in the top. You can skip this step if you prefer to just put a few slits in the top for vent holes. Gently place second crust on top of apples and butter. Trim off the extra crust and crimp the edges together. Place extra dough cut-outs on top or slit the dough in a few places to vent. In a small bowl, mix together the water and egg. 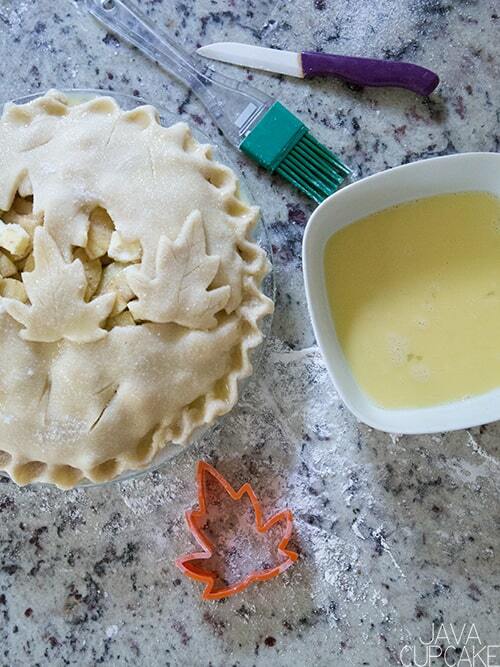 Brush the egg wash over the entire surface of the pie. Place the pie on a baking sheet and bake for 15 minutes at 375F degrees. Reduce heat to 325 F and continue baking for 45-70 minutes or until the crust is dark, golden brown. If the edges begin to burn, cover them with a pie crust cover or tin foil. 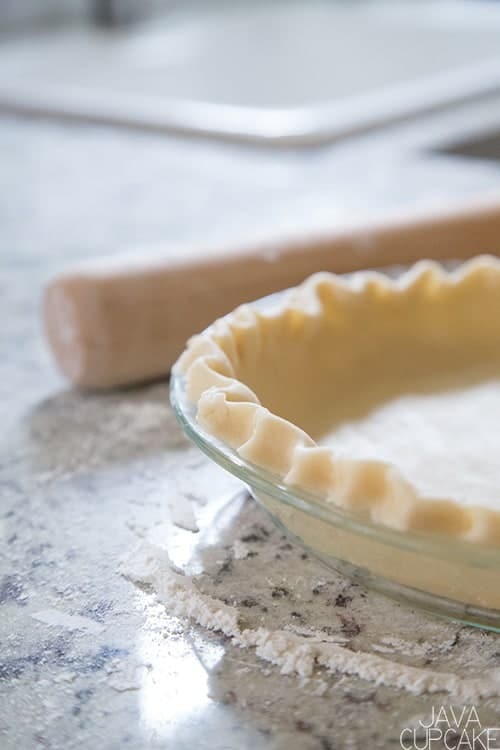 This simple, buttery and delicious recipe for easy-to-make all butter pie crust will be your go-to recipe once you try it! Most people who follow my blog know that I hate making pie crust from scratch. For the past 10 years, every time I tried making it, I just couldn’t get the consistency or texture just how I wanted it. 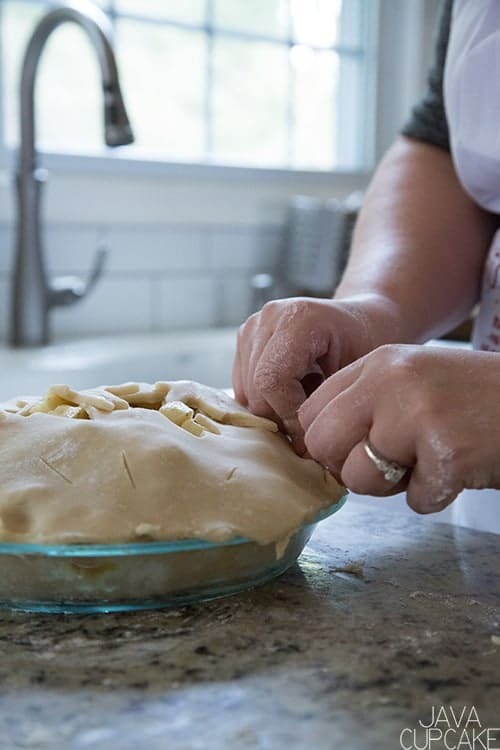 Then, my fellow blogger and friend Dorothy over at Crazy for Crust posted a video and tutorial to make a pie crust that I had never seen before. Her recipe used a food processor instead of cutting in the butter by hand. I was intrigued and knew I needed to test this method for myself. What I found was that using a food processor took all the work out of making an all butter pie crust and was completely fool proof! Even I couldn’t screw it up! Using ice cold butter and ice cold water were the keys to creating that flaky crust. 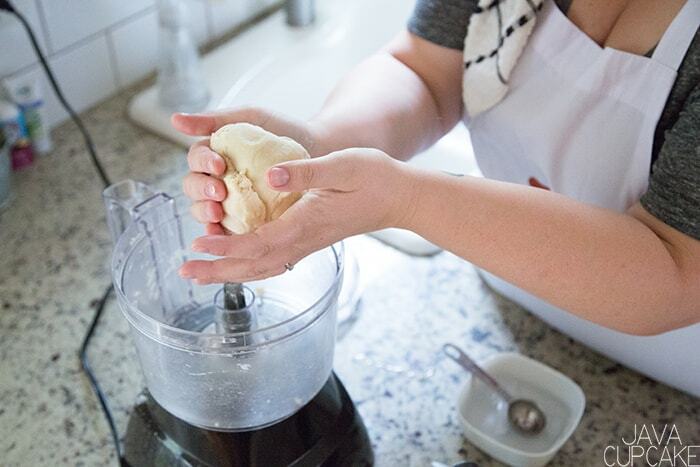 The blades of the food processor cut the cold butter into the flour perfectly, making a soft dough perfect for all my holiday pies! One batch of this makes enough for one pie crust, which I really like. 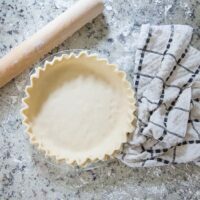 I make the crust when I need it and don’t have to worry about the dough getting too warm while I’m making the filling or prepping other ingredients. 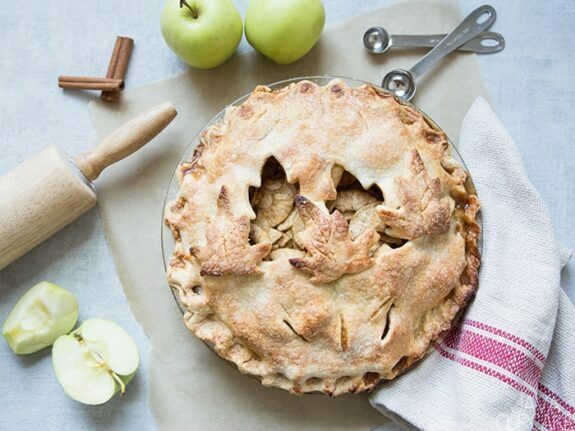 For an apple pie, I make the bottom crust, fill the pie, chill it… THEN make the top crust! I don’t even clean the food processor out between batches. During the holiday season, this all butter pie crust works great with any fruit or custard pie. It can be pre-baked or filled and baked. This all butter pie crust is the BEST crust ever! Dice cold butter into cubes and freeze for 10 minutes. Mix 1/3 cup water and 4-5 ice cubes together in a small bowl. Set aside. 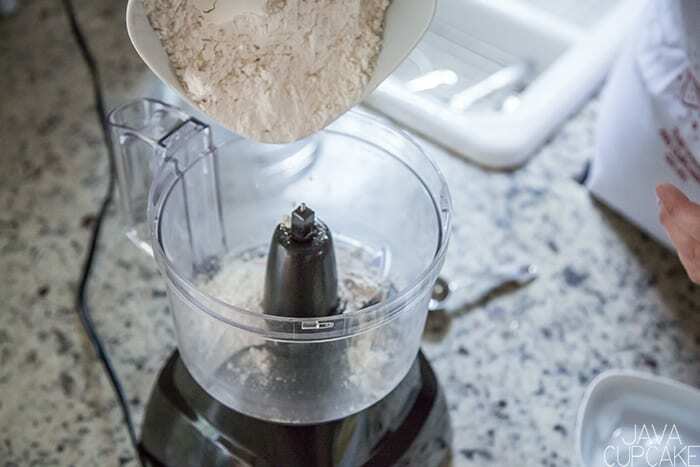 Mix together the flour and the salt in a small bowl then pour into the bowl of the food processor. Add the cold cubed butter and pulse together until the butter is crumbly. Add 2 Tbsp of ice cold water and pulse the dough. Add up to 2 Tbsp more of ice cold water and pulse until the dough comes together in a ball. Dust flour over a clean surface and place dough on top. 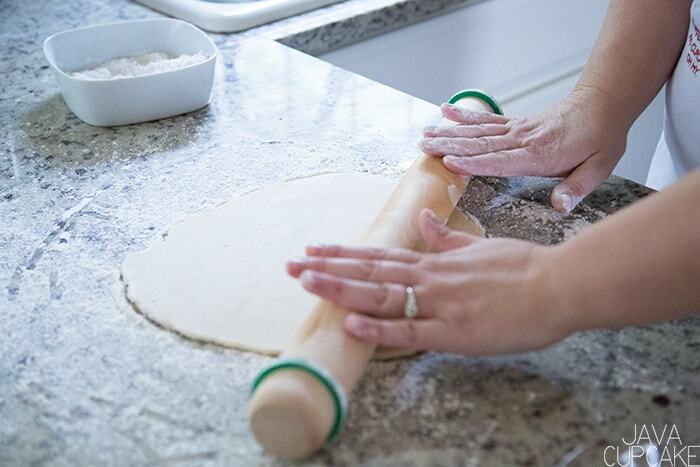 Using a floured rolling pin, roll dough into 11-12 inch circle. Using the rolling pin, transfer the dough into the pie plate and gently press into the plate. Trim the extra dough off the edges. 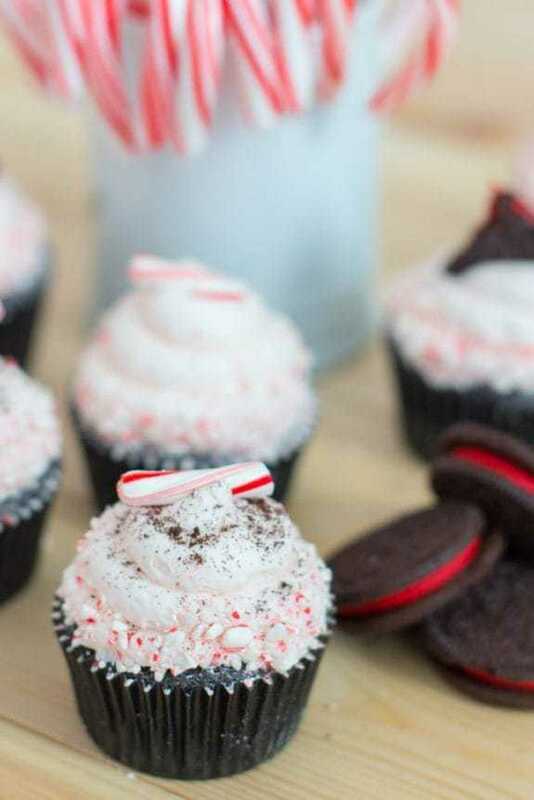 Rich chocolate cake baked with chunks of holiday OREO cookies topped with whipped peppermint buttercream loaded with candy cane chunks makes my Dairy Queen Blizzard inspired Candy Cane Oreo Cupcakes the perfect holiday treat! No, I didn’t get paid to make these cupcakes. Instead, inspiration hit me at a time in my life when I thought baking wasn’t a passion anymore… that I was burnt out on cupcakes. Last week, my family and I were watching TV and a DQ commercial for candy cane oreo Blizzards came on and I said WOAH that sounds delish. No naturally we went to DQ to try them and of course they were delicious. I had not felt inspiration to bake something new in 10 months. This feeling was strangely familiar but it somehow felt different, but I knew I had to see it through to the end. So, I went to the grocery store, bought all the supplies (can you believe that the candy canes were hard to find?!!) and scheduled a day to bake. The DQ Blizzard has big chunks of candy cane and OREO in it, so I knew I wanted my Candy Cane Oreo Cupcake to have the same. I started with my dark chocolate cake recipe and filled it with pieces of OREO. Next, my traditional whipped buttercream got kicked up a notch by adding peppermint extract and tons of crushed candy canes to it. I couldn’t decide how I wanted to garnish these cupcakes, so I did it a few different ways. 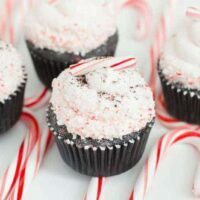 All of the sides were lined with crushed candy canes and some were topped with an OREO chunk, crumbles or a candy cane. 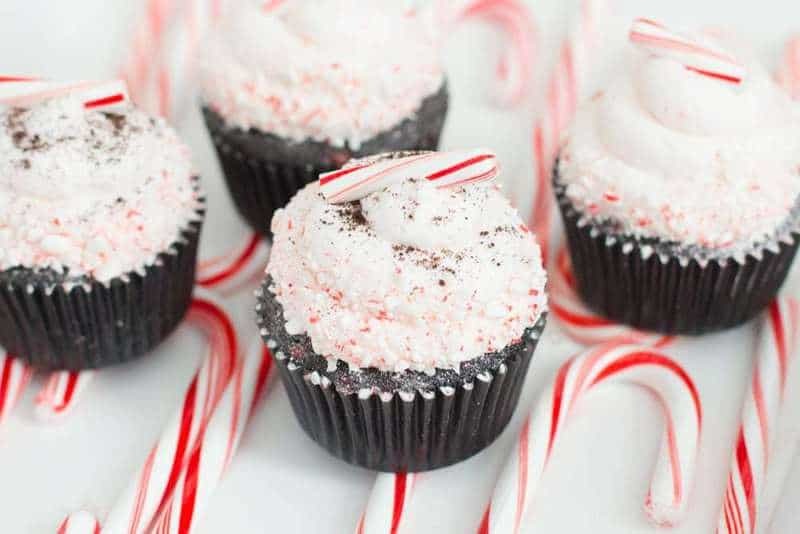 The peppermint chocolate combination is one of my favorites for the holiday season and these cupcakes do not disappoint! In a medium sauce pan, melt the butter. Add the coffee, espresso powder, cocoa powder, and vanilla and whisk until combined. Set aside to cool slightly. 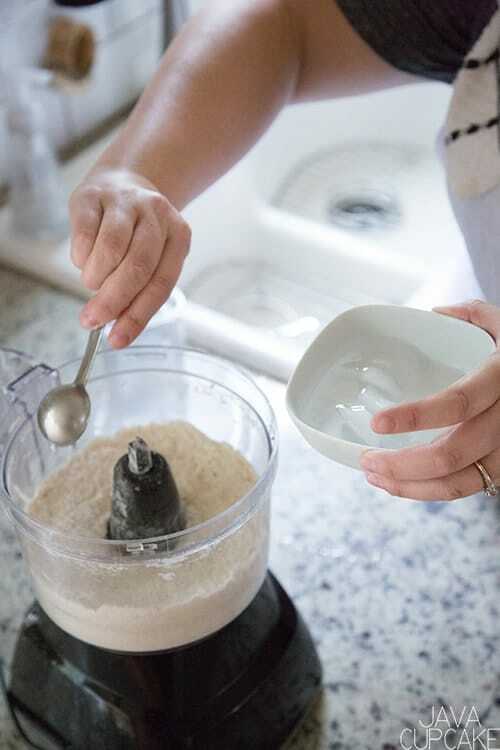 In a large bowl, sift together the sugar, flour, baking soda and salt. Add the chunked OREOS and toss to coat. Set aside. In a medium bowl, whisk together the sour cream and the eggs. SLOWLY add a few tablespoons of the chocolate mixture to the sour cream and eggs. Whisk to combine. In a slow stream, whisk in the remaining chocolate mixture until combined completely. Fill cupcake liners ¾ full. Bake for 18 minutes or until a toothpick comes out clean. Cool in pan for 5 minutes before removing to a wire rack to cool completely. Crush candy canes in a food processor until they are very fine, small pieces. Divide in half. In the bowl of your stand mixer, mix the butter until smooth, about 30 seconds. Add half the sugar and mix until combined. Add the remaining sugar and mix until incorporated. Scrape the sides of the bowl and add the peppermint extract and half the cream. Mix until combined. Add the remaining cream until you reach your desired consistency. Less cream for stiffer frosting, more cream for softer. Mix on high speed for 3-5 minutes or until light and fluffy. 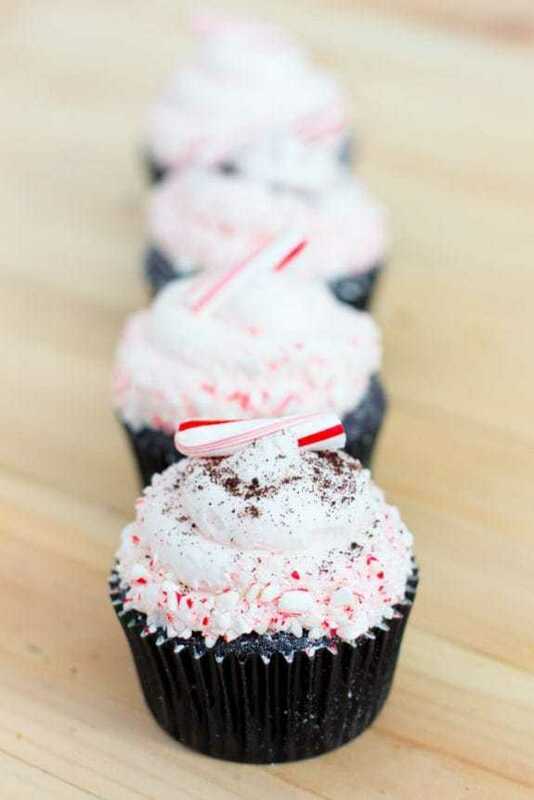 Using a large round piping tip fitted on a piping bag, pipe swirls of frosting onto each cupcake. Press crushed candy cane pieces onto the side of each cupcake. 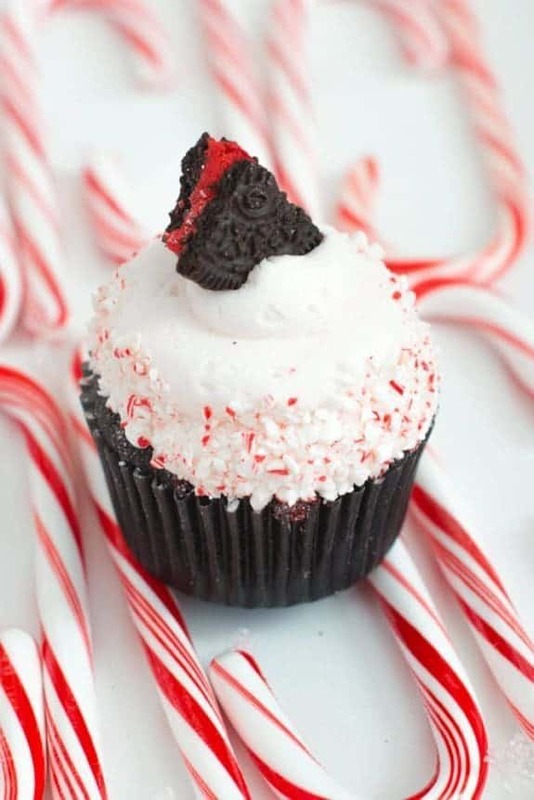 Top with an OREO or candy cane piece or however else you want to decorate it! 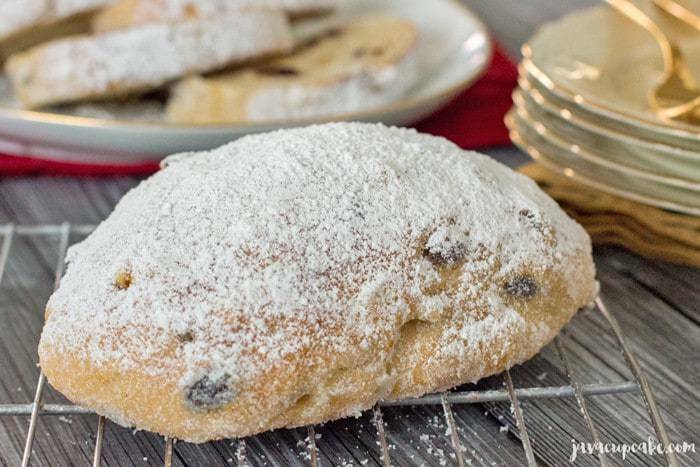 Celebrate the holiday season with this traditional German Christmas Stollen filled with rum soaked raisins and topped with melted butter and sugar. It’s the perfect accompaniment to morning coffee or afternoon tea! Every Christmas season in Germany, the local bakeries produce the most magnificent bread that I eat dozens of loaves of. 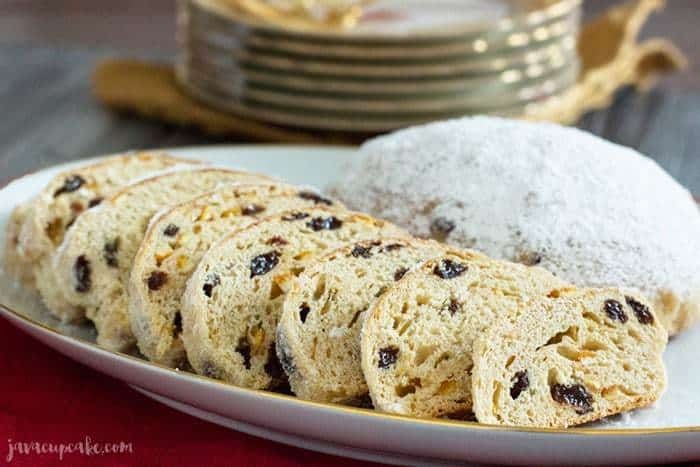 This Weihnachtsstollen (Christmas Bread) dates back to the 1500’s in Germany when it was first made with oil because during the Advent season butter was prohibited. This oil based dough was hard and tough and not as good as when made with butter. 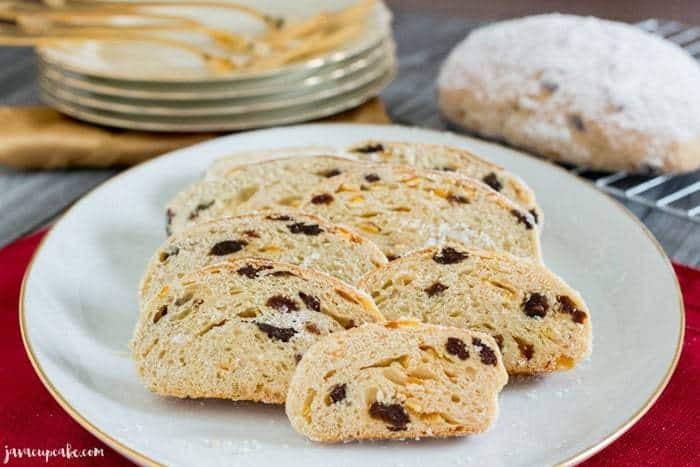 Over time, the people were allowed to use butter in the Stollen and it evolved into a sweeter, fruit-filled dough versus the flavorless dough of the 1500’s. Today, the most popular and historic Stollen comes from Dresden and is baked and sold at the Dresden Christmas Market. This tradition has been taking place since the 1500’s and draws thousands of people to the market every Advent. The traditional Stollen is baked in a long bell-shaped pan, but bakers all across Germany also bake it free form in an oval-shaped loaf like I made here. Typically, I am not a fan of making yeasted dough, but I really wanted to learn to make my favorite German bread before I left Germany. This dough begins by mixing the flour and yeast together then adding warmed butter and milk. The technique works perfectly for me because I always seem to ruin the dough when I have to mix the yeast with sugar and warm milk first. This method of adding everything at once to the mixer makes it practically impossible to mess up. 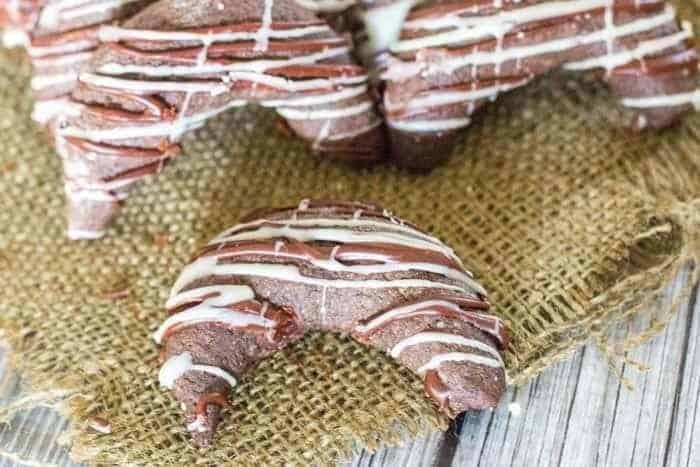 This recipe comes from a baking Facebook group that I’m a part of. An older gentleman that’s in the group has been making hundreds of loaves of this German Christmas Stollen for decades and was kind enough to share his family recipe. I tried his recipe exactly as he wrote it and I ended up burning the bottoms of the bread. It still tasted amazing, just a little too brown on the underside with an aftertaste that was less than to be desired. So, I tried the recipe again making a few adjustments. I added more rum, raisins and candied orange to the dough as well as doubling up on the baking sheet, lowering the temperature and raising the rack in the oven. All of these changes helped to make the perfect Weihnachtsstollen you see here! 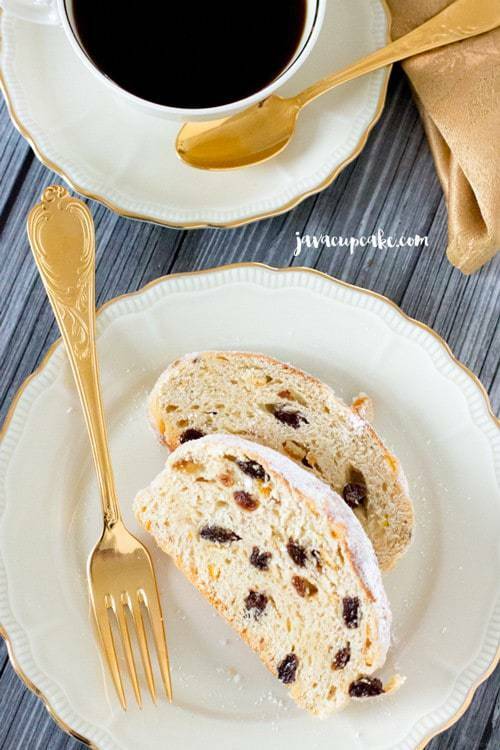 I love how beautiful the Stollen looks on the platter with my Christmas decorations on my dining table. 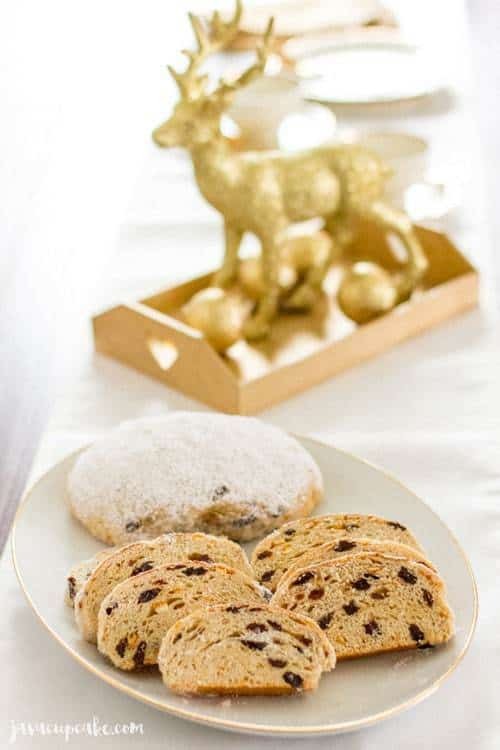 Serve the Stollen with butter and a hot cup of coffee and you’ve got the perfect treat for friends and family. I even got out my beautiful Bavarian porcelain and antique gold silverware to enjoy a cup of coffee and Stollen when my German friend Mariele came for a visit. We sipped on coffee and ate as our children played. It was perfect. Do you have a favorite Christmas bread? 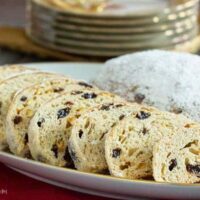 Have you ever made this Weihnachtsstollen before? I’d love to hear about it! In a large bowl, combine the raisins, candied orange and rum. Soak for several hours or overnight. Grate the orange & lemon. Place the grated peels on a baking sheet and dry in at 225F oven for 5 minutes. Set aside until ready to use. In the bowl of your stand mixer fitted with the paddle attachment, mix together 3 cups of the flour and the yeast. In a medium saucepan, heat the milk, butter, sugar and salt the butter has melted and the mixture is warm stirring constantly to melt the butter. Remove from the heat and let cool for 5 minutes. Once cooled, but still warm, add this mixture to the flour & yeast and mix on low until combined. Scrape the sides of the bowl and add the beaten eggs, almond extract, and grated peels and mix on medium speed for 30 seconds. Scrape the sides again and mix on high for 3 minutes. By hand, stir in the raisins and oranges soaked in rum. Replace the paddle with the dough hook on the mixer. Add 5 cups of flour and turn the mixer on medium for 3-4 minutes. Remove the dough from the bowl and place on a counter covered in 1 cup of flour. Knead the flour into the dough for 4 minutes. Pat the dough into a large ball. Oil a large bowl and place the dough ball into the bowl, turning to coat the outside in the oil. Cover the bowl with plastic wrap and set in a warm, moist place for 90 minutes or until doubled in size. Punch down dough 3-4 times. Remove the dough from the bowl divide into 8 even pieces. I weighed the dough in grams then divided by 8. I weighed each dough ball to the same size to ensure consistency among my loaves. Cover with a towel and let rest for 10 minutes. Form each piece of weighed dough into an oval shaped loaf the place on a baking sheet covered in parchment paper. Once all the dough is on the baking sheet, cover with a cloth and let rise until doubled in size, about 45 minutes. Preheat oven to 375F degrees if using a light baking sheet. Preheat oven to 350F degrees if using a non-stick/dark baking sheet. Bake the dough for 30 minutes on the top rack in your oven. Rotate the pan 180 degrees then bake 5 more minutes. Check the bottom of the loaves to ensure they are not burning. Bake 5 more minutes if necessary but do not over bake! The loaves will be perfect when the bottoms are golden and the tops are firm and a light brown. Remove the baked loaves from the sheet and allow them to cool on racks until completely cool. Place the 2-3 cups of sugar into a rectangle baking dish. Brush melted butter over the entire top surface of each loaf the place in the baking dish with the sugar. Scoop the sugar over the entire loaf so it's covered completely. Tap off any extra and then place back on the cooling rack. Repeat with all the loaves. Dust a generous amount of powdered sugar over the top of each loaf. Wrap in plastic wrap or place in a gift bag for storage. Do not place in a plastic box, the sugar will melt into the bread. The Stollen will stay fresh for 2-3 days but after that will begin to dry out. It's best if enjoyed immediately! Check out these other German recipes I have made since living here! 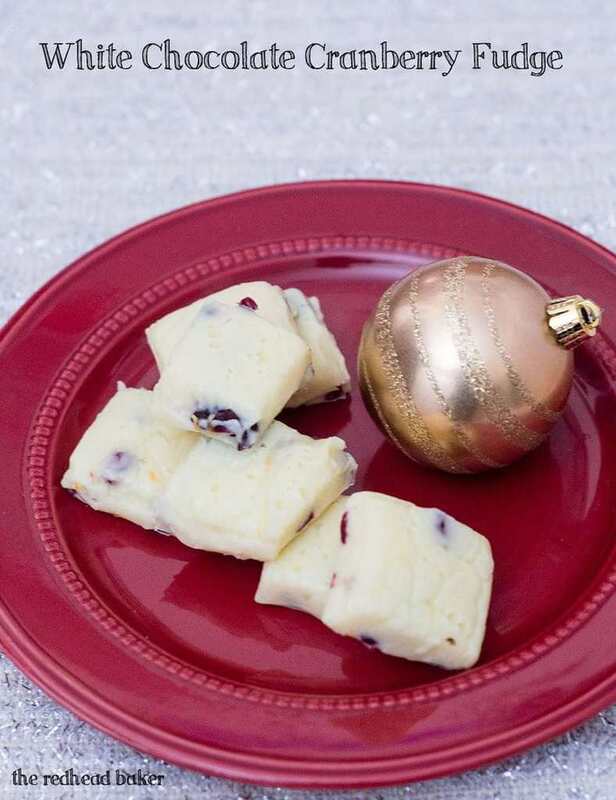 Quick white chocolate cranberry fudge with hints of orange is a delicious addition to holiday party trays, or package it up for a festive homemade gift! Hi! 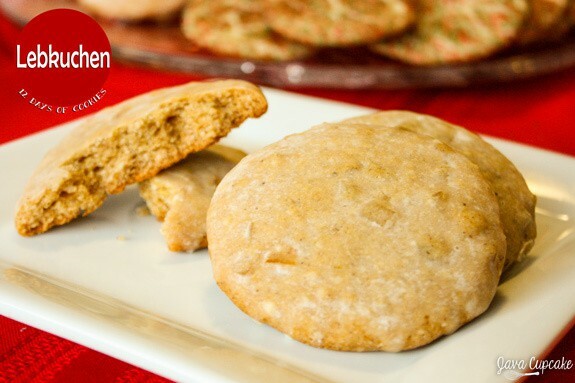 I’m Coleen, and I blog over at The Redhead Baker. I share family friendly recipes for home cooks of all skill levels. I like to make baking easy, sharing the “why” behind the recipe. I’ve been blogging for six years, and my fiance and I live with our four-year-old son and two rescue dogs. Christmas is my favorite time of year, and in addition to nearly a dozen kinds of Christmas cookies, I love making different flavors of fudge. My quick fudge starts with two ingredients: condensed milk and chocolate, then can be varied with different additions. 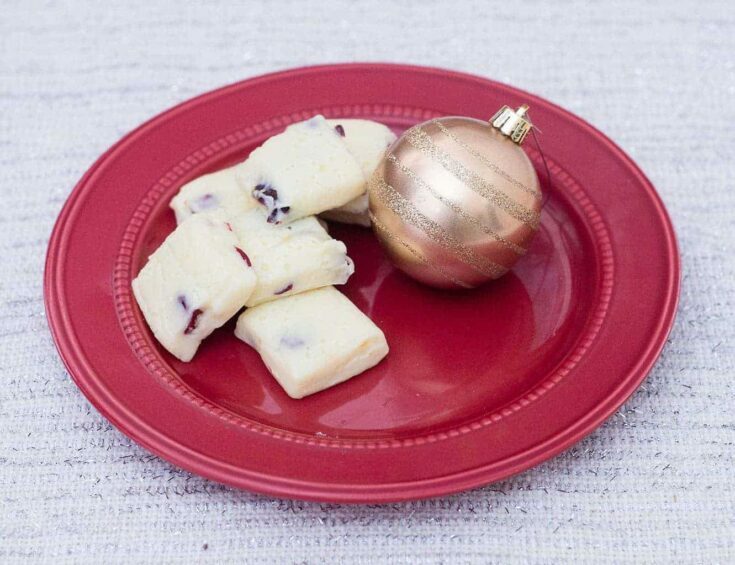 In this version, I use orange zest and dried cranberries. 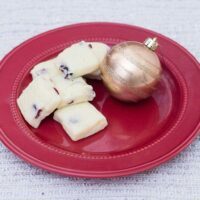 White chocolate burns at a much lower temperature than milk or dark chocolate, so keep your oven burner on the lowest flame, and stir constantly to avoid scorching. Also, chopping your chocolate finely will help it melt evenly and avoid scorching. Once thoroughly chilled, cut the fudge with a chef’s knife. If serving on a dessert tray, place the pieces on flatted cupcake liners. If giving away as a gift, place a few pieces of fudge in a cellophane treat bag and tie with a festive ribbon! This is a very soft fudge, so keep it chilled as much as possible to keep its shape. If you want firmer fudge, reduce the amount of sweetened condensed milk to half a can (about 3/4 of a cup). Get more recipes from The Redhead Baker on Facebook, Twitter, Instagram and Pinterest! Line an 9-inch by 9-inch baking pan with wax paper, leaving about 3 inches of wax paper hanging over the edges of two sides. Place the condensed milk and chopped white chocolate in a saucepan set over low heat. Stir constantly until the white chocolate is melted and the mixture is smooth. Remove the saucepan from the heat, and stir in the orange zest and cranberries. Pour the mixture into the prepared pan. Cool to room temperature, then chill in the refrigerator until the mixture is firm. Cut into 1 1/2-inch by 1 1/2-inch squares. 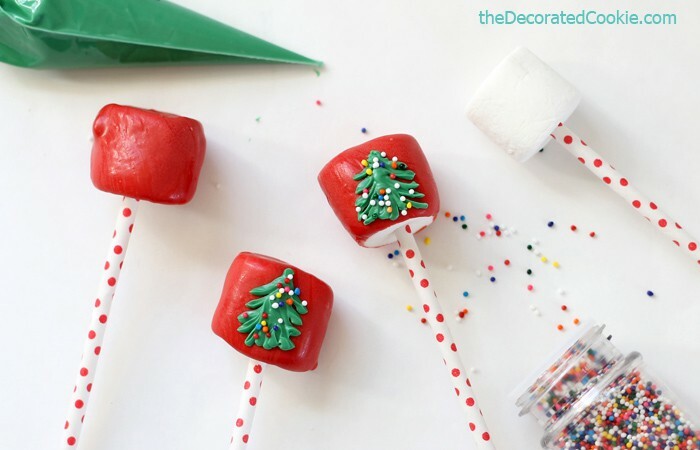 If you’re in need of a fun, quick, delicious treat for your next holiday party then you’ll need to make these adorable Christmas Tree Marshmallow Pops! 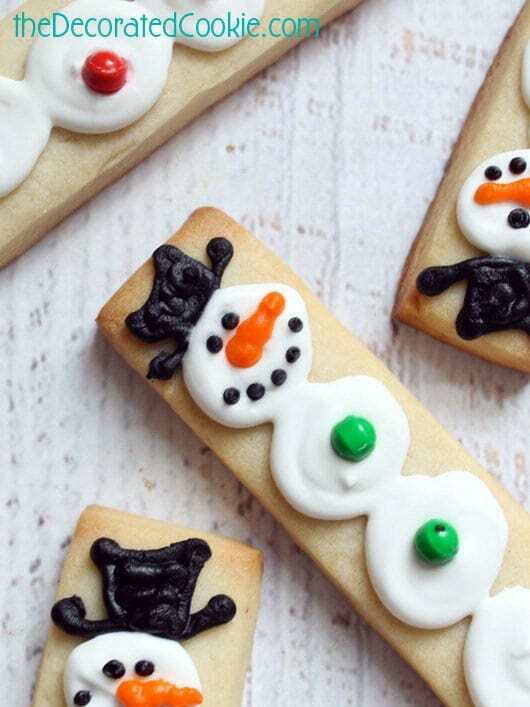 Thanks to Meaghan of The Decorated Cookie for providing this guest post and such an adorable holiday treat! Greetings dear readers of JavaCupcake! I’m Meaghan, of The Decorated Cookie, where I blog about sweet and easy food crafts. It’s not easy to fill the shoes (fill the measuring cups? let’s go with measuring cups) of baker extraordinaire Betsy, so I’m thrilled she let me visit today. I share Betsy’s love of baking, but I also love shortcuts. Because aren’t we all so busy all the time? I mean, not for checking facebook, which I always have time for, but for everything else. One of my favorite sweets to decorate is store-bought marshmallows. I do a lot of marshmallow decorating. Too much marshmallow decorating, though my two kids would say you can never have enough marshmallows. 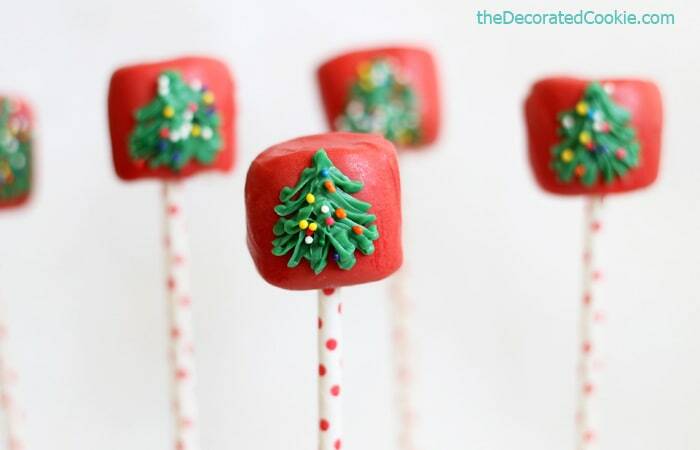 These Christmas tree marshmallow pops are simple to make, yummy to eat, and impressive to display or give. To serve at a holiday party, wrap a Styrofoam block (found at the craft store) with red or green tissue paper and prop in the block. 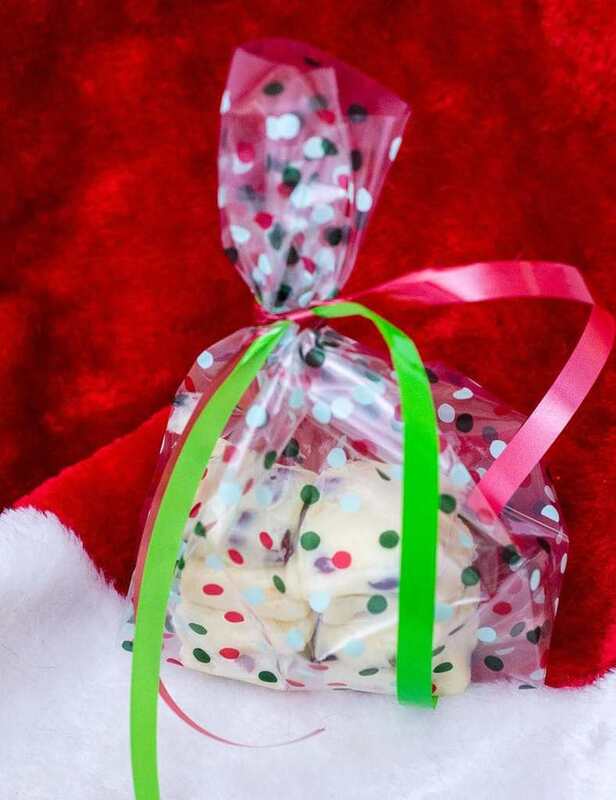 To give as gifts, once the candy has fully hardened, place a small cellophane bag (also at the craft store, gosh I love the craft store) over the marshmallow and tie with ribbon. 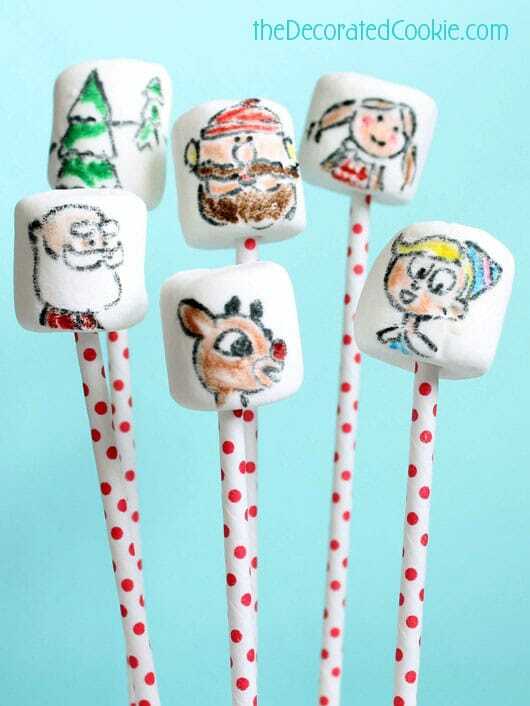 You can also pipe any design you like on the marshmallows. Try holly or wreaths. For a non-denominational marshmallow, dip the marshmallows in blue, pipe green evergreen trees and dust with confectioner’s sugar for snow. See? Marshmallows have endless possibilities. If you’re new to marshmallow pops, here are a few tips. I added vegetable shortening to the candy melts, which is optional, but it makes for much easier dipping, as the melts are thinner. I didn’t add vegetable shortening to the green candy melts, because I didn’t want the candy too runny. And I only snip a tiny bit off of the decorating bag so I have control over the piping. 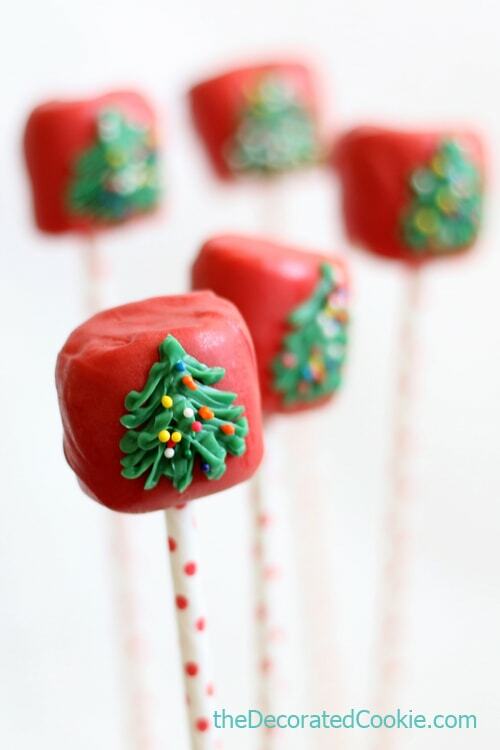 Candy melts dry pretty quickly, so add the sprinkles after each tree you pipe, not at the end. Once you get the hang of dipping and piping, these marshmallow pops are a quick and easy Christmas dessert you can whip up in minutes. 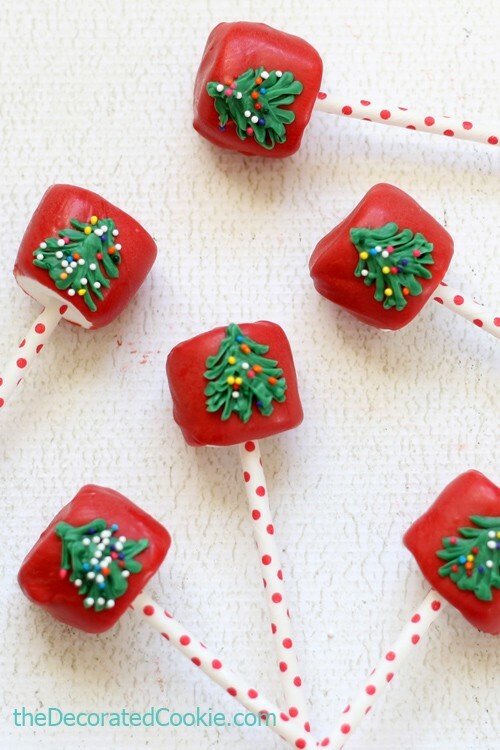 Christmas tree marshmallows are a quick and easy treat to make for the holidays. Skewer the marshmallows with the lollipop sticks or straws and set aside. In a deep, microwave-safe container, place the red candy melts and the shortening. A glass measuring cup works well. Microwave at 70 percent power for 90 seconds. Stir and continue to microwave at 30 second, then 15 second, intervals until fully melted and smooth when well stirred. Dip a marshmallow into the melted red candy, gently tap on the side of the container to remove excess, and prop in the Styrofoam block. Dip all the marshmallows and let dry well, about 30 minutes. Place the green candy melts in a disposable decorating bag. Place the bag on a paper towel in the microwave. Microwave for 90 seconds at 70 percent power. Massage the bag and continue to microwave at 15 second intervals until the candy melts are fully melted. Snip 1/4 inch from the tip of the bag. 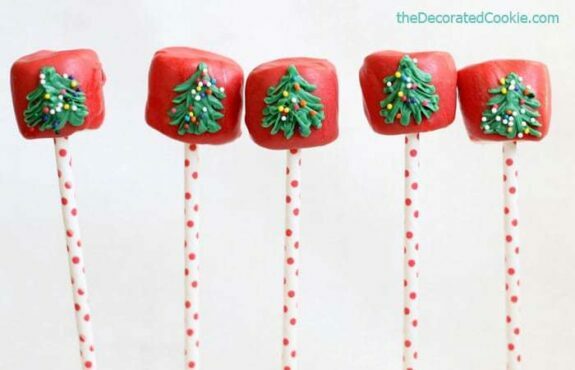 Place a marshmallow on its side and pipe a Christmas tree on a marshmallow. Immediately sprinkle with sprinkles. Repeat with the remaining marshmallows. Prop in the Styrofoam block and let dry well, at least an hour. Stop by and see me some time at the decorated cookie.